Guests arrive today individually to begin this exciting Norwegian winter tour. 5:45PM -09:30 Pick up at hotel. 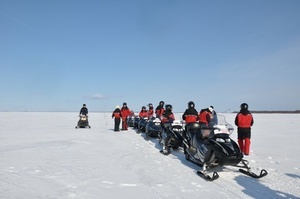 Guided snowmobile tour to our catching places on the ice (if ice conditions are safe, otherwise we pick the crabs in the harbor). King Crab Catch. 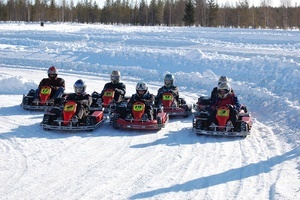 Driving tour by snowmobile (2 person per snowmobile). 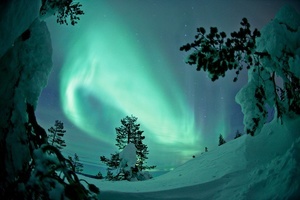 During the trip we will have several stops to be able to watch the northern lights. After the snowmobile ride, we sit by the campfire in the lavvo and enjoy fresh king crabs with garnish + coffee and tea. Transportation back to Kirkenes. Breakfast at hotel. Free afternoon to explore the city on your own. 5:00PM Pick up at Guesthouse, drop of at Snow hotel. Kirkenes Snow Hotel is a beautiful piece of snow architecture and Arctic nature. The 23 suites, ice sculptures and live reindeers make this the most photographic spot in the Norwegian Arctic. The Snow Hotel is situated 6 km from Kirkenes. The rooms are build of snow and there is a average temperature of -4 C inside. 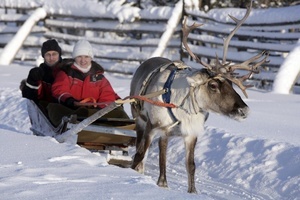 Enjoy the dinner at our gorgeous restaurant, nestled in amongst the Reindeer Park and husky farm. 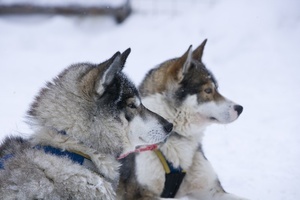 You will be our guest at our restaurant and will have the pleasure of saying hello to the huskies, feeding the reindeer. Also have the possibility to take sauna in the morning. You will be guided all the way and warm sleeping bags are included. Shower/WC, sauna and the restaurant is located in our service building (the warm part of our hotel). Breakfast at snow hotel (possibility to take sauna). 09:00AM Later transfer to our base camp in Pasvik, Pasvikdalen is one of the last wilderness areas in Europe. 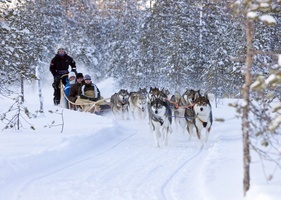 Tour by dog sledges along the Norwegian- Russian border and into the Siberian forest. You drive your own dog sledge (2 persons per sledge). Driving distance is 20-25 km (depends on weather and snow conditions). We serve coffee/tea and lunch outdoors around the open fire or in our Sami lavvu. Kirkenes Snow hotel Experience with transfer from/to Kirkenes, 3-course dinner, overnight stay in sleeping bags, sauna in the morning, breakfast.